Thanks to a call from a fellow RV14 builder, I discovered a mistake I had made during the rudder cable installation. It turns out that for some reason both he, another 14 builder and me had installed the cables the wrong way round. The forked end of the cables should be at the rudder end, as in the picture above. Of course if I had read ahead to 11-10, it’s obvious! So why did all three of us get it wrong? It so happened that on my cables the plastic sleeves were positioned on the forked end, so I think I assumed they had been placed that end on purpose and blindly followed the instruction. I found that by removing the 2 forward rivets on the large nylon blocks I could get enough gap to slide out the cables and swap them to the correct configuration. As Vans encourage, read ahead to understand what you are trying to achieve!! 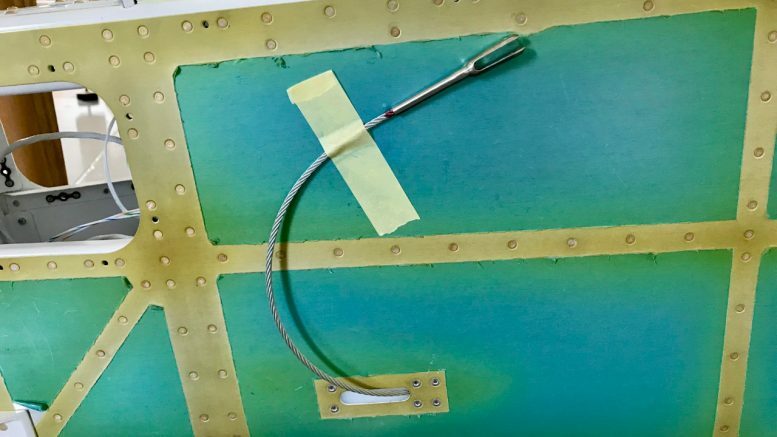 Be the first to comment on "10-21 Rudder Cable Mistake!"